My family loves them some noodles. Along with salad or some veggie, it’s a go-to side for whenever the hubby is grilling. Normally, I go the boxed noodle route, except for the past year or so, I’ve incorporated more homemade foods. When I informed them I was making the side dish myself, you know, the old-fashioned way, they turned up their noses ever so slightly and I saw the shadows of doubt creep across their faces. Oh ye of little faith, family. Heat oil in a large pot over medium-high heat. Add garlic and sauté for 1-2 minutes until fragrant, but not browned. Add chicken broth, milk, butter, and noodles to pot. Season with S&P. Bring to a boil and cook for 18-20 minutes. During the cooking time, the liquid will begin to evaporate. Add more chicken broth and/ or milk to maintain desired creaminess. 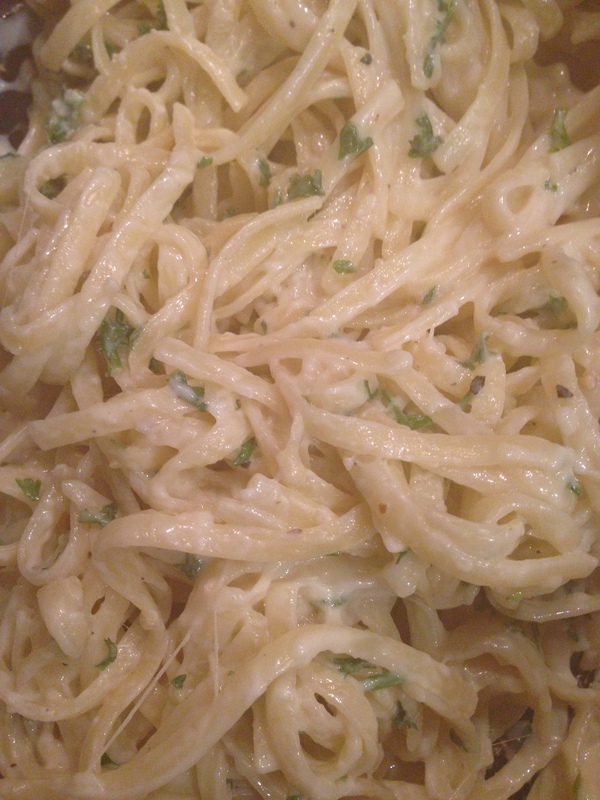 Once cooked all the way through, stir in the parsley, add more S&P as needed, and add in Parmesan cheese. Serve with the main dish and then watch your family eat it up and sheepishly ask for seconds. This entry was posted in Pasta, Sides. Bookmark the permalink.